uhidd is a userland driver/daemon for USB HID devices like mouse, keyboard etc. It is based on libusb20 and currently only works for FreeBSD 8.x and above. The uhidd userland driver aims to support USB HID devices with multiple Top-Level application collections in one interface, i.e, HID devices with multiple logical device sharing one endpoint. This kind of devices currently can not be fully supported by the in-kernel drivers (ukbd/ums/uhid). See the examples section below for examples of such devices and how to setup the driver to support them. uhidd also provide support for multimedia keys found on USB keyboard, a multimedia keymap needs to be created to make it function. See the examples section below. The recommended way to install uhidd is through the ports system instead of compiling the source by yourself. The port will also install rc(8) script and devd(8) config file. uhidd daemon is using libusb20 to access usb device, so it deals with /dev/ugenX.Y nodes. Note that before you can use uhidd with certain ugenX.Y device, you need to make sure there is no kernel HID device driver attached to that device. You could either remove 'device ukbd', 'device ums' and 'device uhid' from your kernel config file and recomplie the kernel, or if these drivers are loaded as kernel modules, kldunload(8) them. The relevant devd(8) rules for those kernel modules in /etc/devd/usb.conf also needs to be removed to prevent them from loading automatically by devd(8). However, uhidd could be also used together with kernel drivers, for example uhidd and a kernel driver can each attach to one interface of the same device. See the Examples section below for details. Note that uhidd will ignore ugenX.Y device that does not have USB HID interfaces, so it is safe to "try" attaching uhidd on any ugenX.Y device. If uhidd daemon and the kernel driver attaches to different interfaces of a device, they can coexist without problems. If uhidd daemon finds out that a kernel driver is active on a device and the command line option -u is not specified, it will abort. Use the GENERIC kernel or a kernel compiled in USB drivers. Use uhidd option -u to detach kernel driver when needed. Note that if you have USB kernel drivers(ukbd(4),ums(4) and uhid(4)) compiled as modules, it's possible that uhidd and USB kernel drivers attach to the device at the same time and cause strange behaviors like mouse cursor jumping, keyboard key repeating etc. It's better to remove the relevant devd(8) rules from /etc/devd/usb.conf in this case. To recover from such issues, you can restart uhidd by /usr/local/etc/rc.d uhidd restart. The uhidd daemon attaches interface driver to each interface of the device and attaches sub class drivers to the top-level application collections inside the interface. Keyboard: The keyboard class driver will create a virtual keyboard using the vkbd(4) interface and write(2) the data (scancodes) received from its parent to the vkbd control device. User programs (for example X window system) and text console can use the virtual keyboard the same way as other normal real keyboards. (See also bthidd(8)). Mouse: The mouse class driver will open the /dev/consolectl special character device and pass the data (mouse events) to it. It works just like the moused(8) daemon. Consumer Control: The Consumer Control class driver is basically a special keyboard driver that handles multimedia keys found on USB keyboard. This driver translate multimedia key usages to key codes and then an application can handle the key event the same way as any other normal key. See the Multimedia Keys section below for details. To support multimedia keys basically is to translate USB consumer usage to keycodes. A multimedia keymap that describes the usage and keycode binding is required in order to make it work. You can build the keymap manually, or better you can let uhidd generate it automatically. When you start uhidd on a USB mutlimedia Keyboard without a pre-configured keymap, uhidd will prepare a in memory keymap. Each time you pressed a new multimedia keys, uhidd will remember the key(hid usage) you pressed and assign a free keycode to it, then it adds the usage<->keycode binding to the in memory keymap. The keymap will also be written down to the file /var/run/uhidd.ugen.X.Y/cc_keymap, what you need to do is copy the keymap to the configuration file /usr/local/etc/uhidd.conf, so next time uhidd will load the fixed keymap for this keyboard instead of generating another new keymap again. To use the translated keycodes under X window, you will need to write yet another keymap .Xmodmap that map the keycode to X window key event. See the Examples section below for an complete setup example for Mircosoft Wireless Desktop 1000. To build the keymap manually, you need to know the consumer usage names and a bunch of unassigned keycodes. Consumer usage name list can be found in usage_consumer.c in the source code tarball. A list of free keycodes and the format of the keymap is documented in the uhidd.conf(5) manual page. 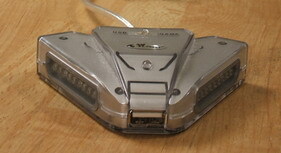 The convertor can support two PS2 hand controls. Below is the appearance of the device. There are two top-level application collections (joystick) corresponding to the two PS2 hand controller it supports. The first controller has report ID 1, and the second has report ID 2. This converter works just fine under M$ Windows, but it won't work under FreeBSD (or Linux the last time I tested, it attached as just one /dev/js0) The problem is that some applications/libraries (for example devel/sdl12) that deal with USB joysticks expect that there should be exactly one /dev/uhid<X> node for each USB joystick, but here we got one /dev/uhid<X> for two joysticks. So it just won't work. Then start the application and it should just work. -k tells the daemon to attach the keyboard, -m to attach the mouse and -o to attach the consumer control driver to handle multimedia keys. Since the keyboard collection is on a separate interface and is the only child device of that interface, it is possible to let the kernel ukbd(4) driver handle the keyboard interface, while uhidd handles the mouse and multimedia keys. Letting kernel ukbd(4) driver handle the keyboard interface makes it possible to use ddb(4) with this keyboard/mouse combo. At this point, the mouse should work just fine, while additional work is needed to make the multimedia keys work. First you can just press the multimedia keys on the keyboard, at least once for each key. Then check if you can find a keymap file /var/run/uhidd.ugen.X.Y/cc_keymap created by the uhidd daemon. What you need to do is to copy paste the content of this file to your uhidd configuration file (usually /usr/local/etc/uhidd.conf, create a new one if you need) and restart uhidd daemon. The daemon will then load the provided keymap and translate keys according to the bindings defined in it. Note that if you do not copy the keymap to configuration file for this keyboard, uhidd will try to generate a new keymap (probably different bindings) again the next time it restarts. # 0x045e is the vendor id and 0x009d is the product id. # See `uhidd.conf(5)` manual page for details about configuration file. You can put this line into your X initialization file. For most multimedia keyboards, the basic keyboard part and the multimedia keys are on separate interfaces. So it's perfectly OK to let ukbd(4) handle the basic keyboard, and let uhidd deal with the multimedia keys. The uhidd daemon is confirmed working with MICROSOFT WIRELESS LASER DESKTOP 5000 USB and MICROSOFT WIRELESS OPTICAL DESKTOP 1000 USB, and it should work with other models in the series as well. Normally uhidd runs in daemon mode in background. Command line option -d makes it run in foreground. -v makes it output debugging information and multiple -v specified in the command line will increase the level of verbosity. -D makes the daemon dump the report descriptor.